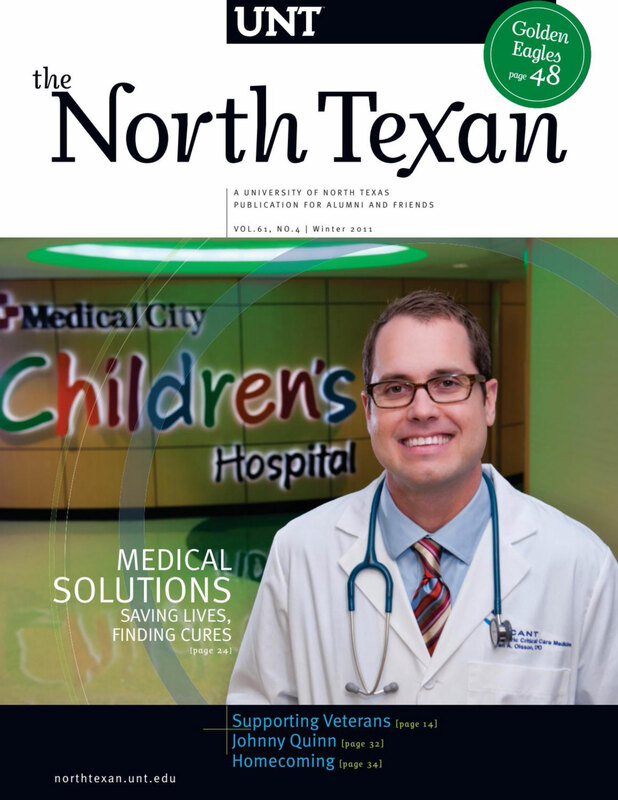 UNT alumni are dedicated to saving lives and improving the health of their communities. The workspace for UNT hospitality management students mirrors the finest industrial kitchens. Members of the class of 1961 remember their time at North Texas. Lt. Michael Kavanaugh, a UNT alumnus, uses preventive medicine to fight off malaria and dengue. UNT alumna Deborah Jones uses psychology degrees to educate others about AIDS and HIV prevention. UNT is Texas' most affordable public research university. Homecoming 2011 takes alumni to new adventures. UNT’s reputation for military friendly service grows while veterans’ contributions continue. The Mean Green's all-time leading receiver is going from the football field to the Olympics. Hundreds of students, faculty and staff lip-synched and danced across campus for the annual video. UNT alumni gather at the Music Academy of the West's summer school and festival. UNT is at the forefront of sustainability with new projects. How can Santa deliver toys to all the children in the world in just one night? UNT alumni Joshua Butler creates Denton film festival focusing on documentaries. Marketing and Logistics working to give its students a greater global understanding. UNT alumna Kimmy Mighell's research experience in Chile gives her new opportunities. Handel’s oratorio marks the latest in a series of collaborations between UNT and the Dallas Opera. UNT alum Tyler DeLaCerda leads design of award-winning airplane seating. Twelve members of the Bishop family have connections to UNT. UNT alum Jason "Buzzer" Koltes enjoys his first season with the famous U.S. Air Force team. Alumni can travel to far-away destinations as part of group cruises. Mean Green soccer wins Sun Belt Conference; UNT adds transfer advisors. A group of UNT graduates' friendship leads to a scholarship fund. UNT’s Apogee Stadium earns highest level certification from U.S. Green Building Council.